Gibson Les Paul Traditional vs Les Paul R7 goldtop ? Discussion in 'Guitars in General' started by StevenStrat, Jan 27, 2012. I'm looking to buy a nice LP, I'm looking at Gibson because they're the most available left handed (and I'm lefty). Currently looking at a LP traditional, which is 2000 euros, and a 1957 RI goldtop, which is 3000 euros. How do they differ sound wise, is the R7 noticeably better, or is a Traditional just as good ? Any better alternatives (left handed !) ? A 57 reissue was one of the best guitars I have ever layed my hands upon! If you can find a used one, I would say go for it. Even so, if you can afford it, I would personally choose the RI. Bear in mind the chunkier neck, as was already correctly stated by Shovelhead. Generally speaking, I think you get what you pay for with these guitars. I've played a Traditional recently that I really liked, but I'd say it was on-par with another very good 2008 Standard that I really liked. I've never played the Historic stuff (haven't made friends with the back-room guy at my local store yet LOL), but I've read nothing but really good-to great things about them. My guess is they're noticebly better than the Gibson USA production stuff - but as you said, they come at about 50% higher price tag. So, they'd darn well better be 50% better guitars. For whatever that's worth mate. Cheers. edit - I'd definitely check the used market on Historics. That's what I'm planning on doing for my next Lester purchase. Can probably score a decent used R7 for about what you'd pay out on a new Traditional. They seem to pop up on eBay and in the Emporium fairly often at decent prices. I've had both and prefer the Traditional. I don't like BB pickups and honestly didn't find anything really special about the R7. The Traditionals just sound and feel like a good LP should to me. There are gems & duds in both the USA & historic lines, but I find that the historics are more often better sounding and better made guitars. There are some decent USAs out there, but are harder to find. Is one brighter than the other ? I do not like muddy les pauls, I prefer them brighter like Robben Ford. The R7 has a substantially fatter neck than the Traditional-at least my Murphy-aged example did. Frets are also narrower and less tall if I recall correctly. You can change pickups to suit you; the other stuff is more difficult. Play both if you can, and decide. Totally agree with this. R7s and R8s are perfect Les Pauls - especially if you like the chunky necks. I have a 2010 R8 that I got for $1900 - best deal I have gotten on a guitar. The R7 is the superior guitar. It will have a bigger neck. Get a second hand R7 or R8 for a little over 2000 EUR. I have a 2009 Traditional Gold Top and an 2009 R8. The Traditional is a great guitar but I have to agree with rockinlespaul that the R7 will be superior. This is the case with my R8. I love 'em both. For different reasons obviously but they are both fantastic instruments. Tough to argue against the R7, unless there is something about the Traditional you like. Never, ever buy without being able to play it first. Do all Goldtop R7s come with off-center seams? I want to get an R7 and have it refinished in SG red like George Harrison's "Lucy"... then swap the Klusons for Grovers. Awesome. Never, ever buy without being able to play it first. ^^^ that's a personal preference. The Gear Emporium on this page, as well as all kinds of on-line music stores, both big-box and boutique would argue otherwise. You really limit your options if you must play before buying. For some people, that's the only way because they are very picky about what they like. Most people do fine buying without trying. Yes its still a gamble, but I've gone through a lot and I'd say I'm about 80/20 for good gear vs. duds when buying like that. Did anyone notice the OP is left handed? The back on this guitar looks incredible! Also, I am with you as far as buying online goes. Out of the 10+ guitars I have bought online, there may have been one that I might have passed on had I played it first. There are plenty of reputable places selling used gear online that also have reasonable return policies. I would say go for the R7. ^^^ that's a personal preference. You really limit your options if you must play before buying. For some people, that's the only way because they are very picky about what they like. Most people do fine buying without trying. Yes its still a gamble, but I've gone through a lot and I'd say I'm about 80/20 for good gear vs. duds when buying like that. I just scored this 1999 R7 for $2,000 and its incredible!!! How long would I have had to wait for something similar to come available locally that I could try out first? Not good odds. I hear ya man--it's awfully tempting to jump on a good deal you find online. But if you are patient you can still score...and with my "method", I'm 100% on good gear vs duds! Remember, these things are wood--they are ALL different, especially when you get into set neck Gibbys. 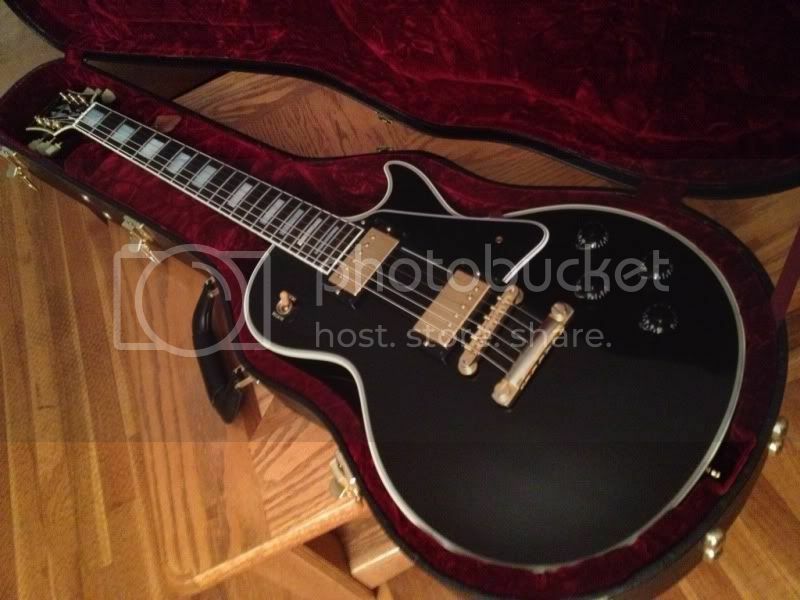 $2500 locally yesterday--2010 Historic Les Paul Custom, 8.2 lbs! No fret wear, no dings, no gamble! Beautiful R7 BTW, love the back! Had a traditional and sold it. Seems like by the time you put the RS kit into it and change the pups...............you might as well get the higher end LP. what was it that you didn't like about the Traditional ?